Health hazards associated with Pb in pre-1978 structures containing lead based paint (LB P) are well established. Of primary concern is the presence of bioavailable Pb in flaking or chipped surface paint, dust, and the nearby soil of these structures when occupied by young children. Other areas of concern are the environs of community buildings and recreational areas in the vicinity of Pb-producing activities, such as heavy traffic, land fills, munitions sites, or industries that use and/or emit Pb. Legally regulated limits of Pb vary from country to country and even city to city. Typical residential regulatory Pb levels in developed countries are 400PPM in residential soil, 40 µg/ft2 (40µg/wipe) in floor dust, 250 µg/ft2 (250µg/wipe) on interior window sills, and 1.0mg/cm2 or 0.5% by weight on painted structural surfaces. Laboratories are well equipped with techniques and instrumentation to measure Pb to confirm legal regulatory compliance. However, lab analyses are not immediate and tend to be expensive and time-consuming. Consequently, there is a need for more timely on-site determinations of potentially dangerous levels of Pb in suspected areas. Tube-based handheld XRF analyzers are the optimum tool to perform Pb measurements directly in the soil, on dust wipes or filters, and on painted surfaces or paint chips and flakes. Should supplementary lab analyses be required, Handheld XRF can be used to optimize sampling at the property in an effort to minimize laboratory analysis costs. The tube-based DELTA Premium Handheld XRF analyzers are equipped with the latest in silicon drift detector (SDD ) technology and floating point processors to accurately detect low levels of Pb within seconds. Preset threshold limits can be preprogrammed for positive/negative or pass/fail Pb tests for PPM, % weight, or mg/cm2 requirements. DELTA Handheld XRF Analyzers provide fast, accurate, precise results well within typical regulatory LOD levels. These modern tube based Handheld XRF analyzers eliminate problems associated with older radioactive source-based Handheld XRF such as isotope loss of speed, high replacement costs, and post 9/11 regulatory and transportation restrictions. best case interference free matricies. in children's play areas, such as yards, parks and ball fields. density, high volume sampling to correctly characterize a site. 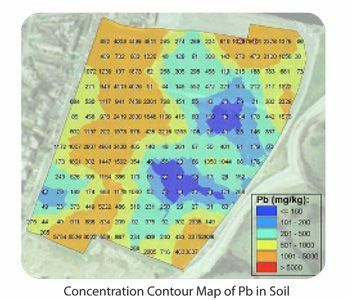 successful use of Handheld XRF analyses at US Superfund sites. and OSHA developed dust wipe and filter analysis methods. Urban Development Regulators, and Customs Agents. DELTA Lead Paint Handheld XRF Analyzers test for Lead (Pb) in seconds. These reliable, tube-based units are light in weight and ergonomically designed for all-day testing. They start fast and stay fast - no isotope fade. And, they have a low total cost of ownership. Before you begin structural repair - grinding, cutting or painting - screen for Pb; then, check your work area after clean-up.